I had a watch like this years ago and I loved it. Easy to change bands and went with so many outfits! This stunning designer inspired interchangeable womens watch set features five faux leather bands which can be placed on a beautiful silver watch case to create your look for the day! The easy to read silver watch dial has raised arabic numerals surrounded by 2 rows of sparkling multicolored crystals. The bands can easily be changed by using the tool provided to match your outfits! Dimensions 9.0 In. X 5.0 In. X 1.0 In. 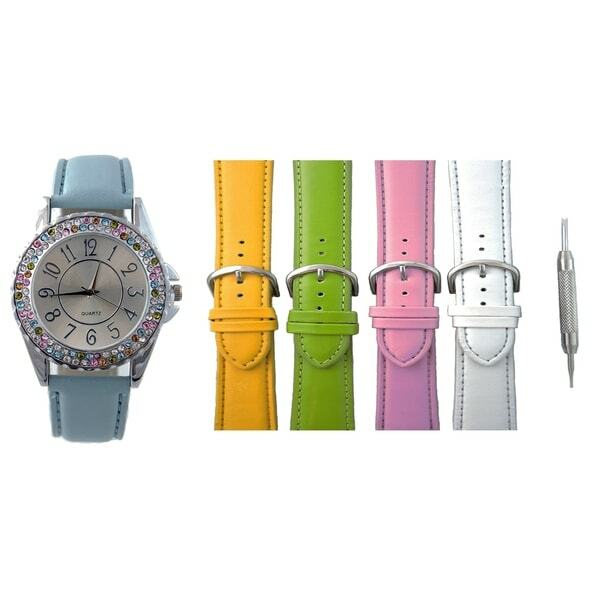 This watch is very pretty and also fun with the colorful bands. I appreciate the tool being provided for changing the bands. I though they were one piece that slid in the ends of the watch but they are two piece bands that need the little springs popped in and out. It's a little more work but I still really like it. The colors are perfect for my clothing. "What part of the watch is white or black? It's an option but for what? Thanks! 😁"